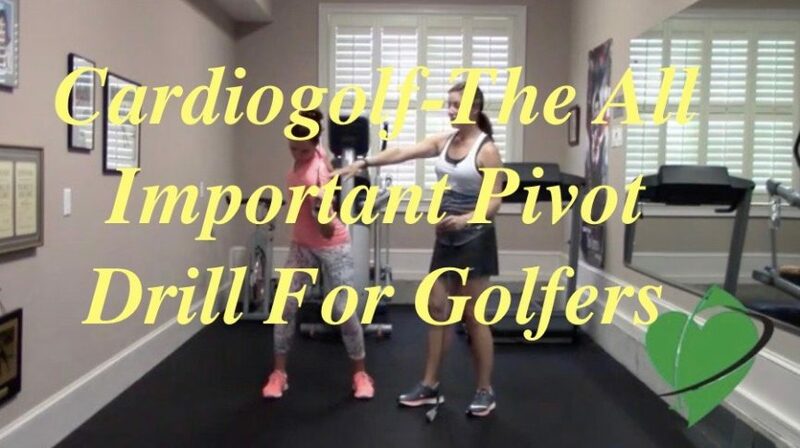 This is your Cardiogolf 5-Minute Golf and Fitness Break where we work on our golf game and exercise at same time. Making practice swings instead of hitting balls is a better way to improve your swing technique. If you are trying to learn the swing or make a swing change, rehearsing the move without hitting a ball will assure that you are actually doing the correct move. Repeating the motion that you want to achieve will help ingrain the move into your real swing.Use the Cardiogolf ‘Shortee’ Club to practice everyday. If you don’t have room to swing a regular golf indoors or you can’t make it to the golf course or driving range, use the Cardiogolf ‘Shortee’ Club to practice anywhere and at anytime. The Pivot Drill not only helps you learn correct body motion and to synchronize the weight shift and arms, but it can also help you stretch your shoulders, low back and build muscular endurance. Assume your golf stance with your club placed behind your shoulders. Return to the start position and repeat exercise.